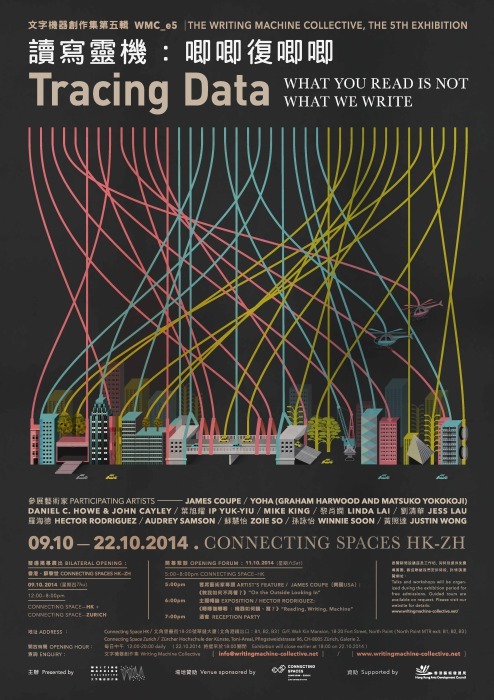 *The joint soft opening of Connecting Space Hong Kong and Connecting Space Zurich will take place on Thursday, 9 October 2014, at 1:30 pm in Zurich and 7:30pm in Hong Kong. The impact of computation on both aesthetic expression and aesthetic criticism has been widely felt. Not only artists but also critics are using digital technologies to analyse works of art and literature. Many scholars in the so-called digital humanities, for instance, use the computer to “mine” individual texts, or large collections of texts, for patterns that are not obvious on the surface. Cinema scholars and experimental artists have also used the computer to re-examine existing films, presenting familiar content in unfamiliar ways. The computer has made possible not only new ways of making art and literature (writing) but also new ways of reading (understanding and analysing it) it. In the works presented in WMC_e5, reading is also writing, and vice versa. The crucial question for us is: How do computational technologies change what we call reading? The idea of reading is to be understood broadly, to include any act of engaging critically and creatively with a text. We understand reading so that it applies to language in a broad sense, including visual, sonic, and cinematic language. What can the act if reading become in a digital context? For instance, how can we read a film, photograph, or literary work through methods of computational analysis? How can we use those methods to read works of visual and literary art in ways that were not previously possible? The topic of reading is closely connected to the question of surveillance. We live in a society where privacy is continually under threat, not only due to government monitoring of activity, but also to the widespread collection, analysis, and exchange of consumer data by companies like Google, Amazon, or Facebook. Techniques of data mining and data analysis play a crucial part in surveillance activities. Data needs to be “read” so as to be rendered useful. Surveillance can therefore be understood as a form of computationally mediated reading. In this way, new forms of reading acquire huge social and political significance. Moreover, many artists use techniques that originated in, or were inspired by, surveillance applications.